You will race a minimum of six (6) USAC sanctioned mountain or cyclocross races in your MT Alpha kit. Additionally, each race team member must volunteer for MT Alpha at the Skills Clinic and one other event put on by MT Alpha Cycling. 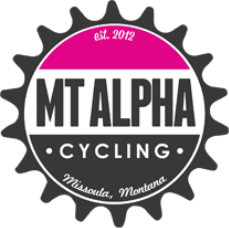 In return, MT Alpha will: 1) pay for six (6) race entry fees; 2) provide you with winter training which includes Momentum circuit classes, trainer/spin bike group work outs; 3) discounts around town at our local sponsors; 4) sponsor shwag. If, as a race team member, you do not satisfy team requirements by the end of the season, access to winter training is suspended. Additionally, you will not be eligible to be on the race team for the following year. If being a race team member seems like too much of a step for you, consider. . .
As a club team member, you are not required to race but are encouraged to ride on MT Alpha weekly group rides. You must volunteer at at least two (2) times during the season. If these criteria are fulfilled, members will receive the option to buy our custom-designed MT Alpha kit, and more to come. See our Club Team Membership Page for more info! We are so excited for this upcoming season and we hope that you are able to join us for another year as an Alpha. Do not sign up for race team if you're signing up for club team!